Fast-paced technological developments have forced researchers to seek out new opportunities to connect people. In today’s world, mobile technology and its users have surpassed the use of desktop computers, as can be seen in the table below. Therefore, the next logical step for the research world should be to follow this trend and target consumers and respondents via mobile surveys. There are two ways to gather valuable surveys by using SMS. These methods are One-way SMS surveys and Two-Way SMS surveys. One Way SMS Surveys are a method used for creating online surveys that are mobile friendly. Instead of sending your survey via email, you can send a personal link to your participants’ mobile devices using SMS. This will allow your participants to access the survey via their mobile internet browser. It takes very little effort, as the respondent simply needs to click the link provided and tick a few multiple choice questions to complete the survey. Mobile surveys may be the best way to reach audiences who frequently use their smartphones like Millennials and corporates. We expect the share of people using smartphones to grow at a rapid pace through 2020, when 87% of all mobile subscribers will have a smartphone, making One way SMS the best way to perform survey research. It is cheaper to use an online questionnaire as it reduces your research costs, it requires only one SMS to send out the link. You will save money on multiple outbound SMS. An online survey provides an opportunity to customize your survey and style it to match your research needs by using images, logo, fonts, question types and even the URL of your survey. Ensure that your online survey provider supports mobile responsive surveys which enable you to maintain your survey design on all platforms. Some people may not have a smartphone or internet access due to financial constraints, but those that do not have a smartphone are usually own feature phones which make them reachable by SMS and can be surveyed by 2 way SMS surveys. This way the general population can be surveys rather than the results being skewed to more affluent audiences. For example, 2 way SMS Surveys have the deepest market penetration of any research method in South Africa. You can send SMS messages worldwide and reach people in rural and inaccessible areas with no internet access. Online surveys require network speed and internet access meaning people with limited network coverage living in rural areas would be excluded from the sample, which could potentially skew the sample towards respondents who live in areas with internet access. Therefore, 2 way SMS surveys can cover areas where other survey methods are not possible. 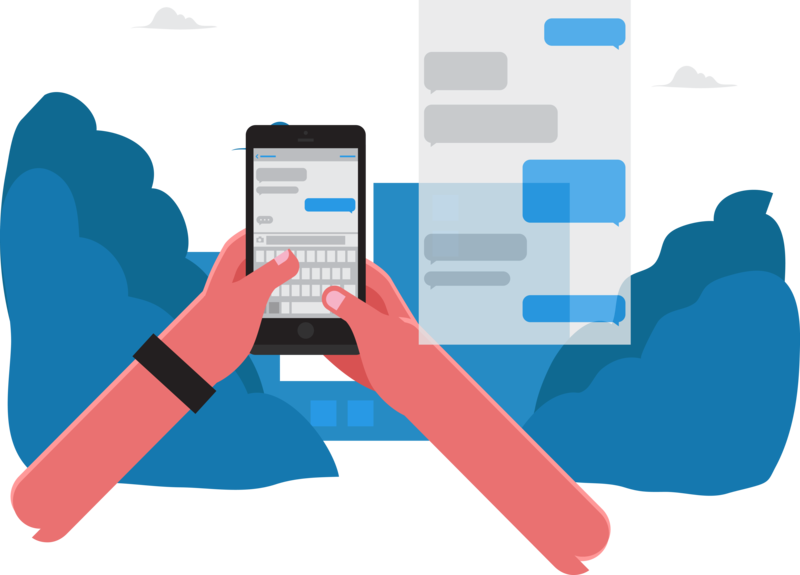 It may seem like a challenge to some to be confined to the 160-character length of SMS, but it is a goldmine for researchers and marketers. It forces us to be clear and concise. Instead of having your respondents lose focus while reading long and boring questions, SMS gets to the point immediately and keeps the audience focused. With 2 way SMS, you can provide an easy Opt-out and make it simple for a person to stop receiving SMS by asking them. This goes against conventional research methods because it gives the ropes back to the respondent and lets them decide how long they want to interact with you. This way you are communicating and asking the questions in the way the respondents believes they are in control of the situation and your response rates may increase.